I’m new to straw bale. How do I get started? Is a straw bale house more energy efficient? Isn’t a straw bale home at greater risk for fire? Do the thick walls provide good sound insulation? How do bale walls carry vertical and lateral loads? How do I find good straw bales to build with? How can I learn the ins and outs? How do I teach Subcontractors what to do? Should I be concerned about the straw getting wet? What does it mean that straw bale walls “breathe”? Do bales restrict my design options? How durable is a home made out of straw? How does building with straw bales help our environment? How do I hang things on the wall? Can plumbing be run through bale walls? Yes. A typical straw bale wall is roughly three times as efficient as conventional framing. Over the life of a typical thirty year mortgage, this superior insulation can reduce energy costs by up to 75%, saving money and vital natural resources. No. Canadian and U.S. materials laboratories have found that: “The straw bale/mortar structure wall has proven to be exceptionally resistant to fire.” In these tests, the flames took more than two hours to penetrate the plastered bale walls. Conventional framing built to commercial standards took only 30 minutes to one hour to burn. Due to their tight compaction, bales contain very little oxygen and thus resist combustion. It’s like trying to burn a phone book. Loose straw; however, is at risk for fire and should be cleaned from the job site daily. Walls should be plastered as early as possible to increase their fire resistance. Pests are more of an imagined concern than a real threat. Once the walls are properly plastered or sided, there is no way for bugs or rodents to get into the bales. If pests were to get inside, they would find it almost impossible to move in the densely packed bales. Termites and other pests pose more of a problem to conventional construction than they do to straw bale structures. Straw bale homes provide superior sound absorption compared with conventional houses. This will be especially important in the town homes. The sound absorption between units will help create separation between common wall homes. In load bearing straw bale structures, the bales themselves carry the vertical loads. High density bales and proper compression are a must to ensure the bales will not settle under the weight of the roof assembly. In-fill structures rely on the framing to carry the vertical loads. Lateral loads, or shear strength, is carried by the wall assembly as a whole. The bales, the structural wire mesh, and the plaster all play a part in the handling of lateral loads. Recent engineering has shown bale wall assemblies to be structural sound even in the most volatile earthquake zones of California. There are a number of things to keep in mind when shopping for bales. Know the size you are designing to (two string, three string, etc…). The straw should be golden in color. Darker straw is often an indication of water damage. Check the density of the bales. The bale should not deform dramatically when lifted by one string. Use a hand held moisture meter to check moisture content. Bales have to be below 20% MC for construction. Finally, check for uniform shape. If the bales are all shaped properly, the baling machine was most likely set well, producing consistent bales. 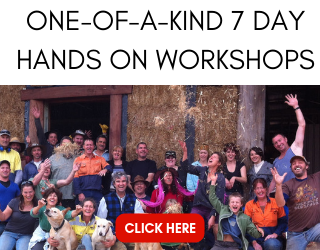 The best way to learn the art of straw bale construction is by taking a workshop. We offer 7 and 14 day intensive hands-on workshops in several locations each year. These events are not only highly instructional, they are also extremely fun and often a life changing experience for those in attendance. You can find the list of current workshops here. 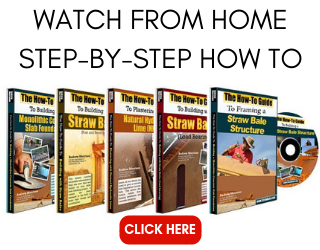 If you are unable to take time off work and attend, consider purchasing one of our instructional Straw Bale DVDs. We cover all aspects of Straw Bale construction from foundation tips to finish plaster and everything in between. Finally, stay informed. The field of Straw Bale construction changes rapidly. To stay up to date make sure you are subscribed to get my E-Mail Updates and my “7 Essential Steps to Straw Bale Success” E-Course. Do I have to design the house differently when using straw bales? It is a good idea to know the size of the bales you intend to use before you start designing. That way, you can keep the modular unit of the bale in mind when laying out the plan. Bales take up more floor space than conventional walls, so use them to your advantage. Use window seats, wall cutouts, and flush mount cabinetry to increase the useable space within the walls themselves. 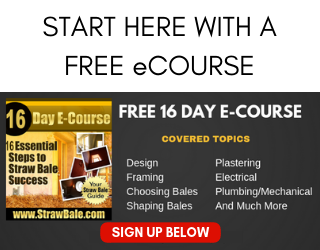 Check our free articles section and on designing with straw bales. Also, check out www.StrawBalePlans.com for a list of current plans we offer for sale. This takes experience. You might want to build a small structure yourself, start to finish, like the one shown in our straw bale DVDs. The techniques described in the DVD will help you fully understand the needs of the subcontractor. Scheduling is a little different that conventional homes because the inclusion of bales affects the installation of rough wiring and plumbing. Use our consultation services. We can teach you the ins and outs and speak directly with subcontractors to help them bridge the gap into the world of Straw Bale Construction. Moisture concerns can be handled easily with proper design and construction methods. So long as the bales are installed when dry (moisture content of 14% or less) and are properly sealed within the plaster and protected from water infiltration, they will perform well. The adopted International Residential Code, Appendix M (“Straw Bale Structures”) has standards in place to accommodate this design and construction. Even if a building is heavily rained on, it will be fine as long as it is allowed to dry out. Problems arise when high moisture levels above 20%) are sustained for long periods of time. Organic material requires both oxygen and water in order to decompose. With proper construction techniques, water will not enter the building thus making decomposition impossible. Rice straw, in particular, has a high silica content which increases its resistance to decay. Straw has been used as an insulating material for many centuries, and has even been found in excellent condition in Egyptian tombs thousands of years old. Straw will not decompose as long as its moisture content is kept low. Bale walls do not breathe in the sense of allowing air to move through the walls. In fact, it is a good idea to limit air infiltration into the walls as air carries moisture. When we say they breathe, we are referring to the movement of moisture through, and out of, the walls. It is critical that moisture moves out of the walls. Permeable plasters such as Lime or Earth should be used in wet or humid climates and Cement based plasters should only be used in dry climate climates, if at all. This transfer of moisture improves indoor air quality without sacrificing energy efficiency and keeps the bales dry. Straw is a natural material, and as such it does not off gas the way conventional insulations do, adding to the health of the home and its occupants. Bale Walls Do Not Breathe! The thick pliable bales actually improve design options. Many nooks and window seats are standard in straw bale construction. Built in furniture, curved walls, landscape features, and sound barriers are all easily accomplished with bales. Bale walls can be finished in many ways. The typical options include lime plaster, stucco, and earth plaster. Each of these materials has its pro and cons although some have more cons than pros. When choosing a finish material, consideration must be given to durability, maintenance requirements, permeability, flexibility, strength, ease of application, cost, embodied energy, and aesthetics. The most important factors are the finish’s breathability, embodied energy, and durability. Bale homes built in the 1800’s till exist in Nebraska and Europe. Straw bale homes have consistently withstood severe weather and wind in Wyoming as well as major earthquakes in California.I will reply to your e-mail about Insider’s Guide #3 so we can get cranking on that material. Many architects and engineers consider straw bales to be the ideal “seismic-resistant” building material. In wind tests, bale structures see no movement in a sustained 75 mph gale and only 1/16 inch movement with 100 mph gusts. The use of straw bales can have a huge impact on our natural resources and air pollution. Each year, the U.S. alone burns or disposes of 200 million tons of ‘waste straw,’ producing massive amounts of carbon dioxide. The use of straw as insulation reduces the need for initial energy outputs in regards to manufacturing. There is less embodied energy in straw as it is available in almost every local market, thereby reducing transportation costs and efforts. Straw is a renewable resource that has a one year growth/harvest cycle. By using this local, agricultural by-product as a building material, we reduce energy expenditures, the amount of straw burned, and the use of fossil fuels needed for material transportation. When a quality plaster is used, most items can be hung directly on the plaster with conventional plaster screws and plugs. This is true for pictures, coat hangers, and other small items. In order to hang larger items such as kitchen cabinets, wooden drive stakes must be used to anchor the hangers into the bales before the plaster is applied. By driving a wooden stake into the tough interior of the bales, a solid base is laid onto which just about any load can be applied. In the case of extremely heavy loads, a bolt can be threaded through the bales and fastened to an over sized washer on the opposite side of the wall. In a perfect world, plumbing would be kept out of the bales entirely. Whenever possible, design a structure so that the plumbing can be run through the floor and interior stick frame walls. Check with your plumber about “wet venting” plumbing fixtures so the vents can also be run through the floor to interior walls. When it is not possible to keep plumbing out of the bales, you can either build a faux wall in front of the bales in which to run the plumbing or you can place the plumbing in a continuous sleeve which will contain any leaks or sweaty pipes. Although Romex is allowed by many codes for straw bale construction, most building inspectors want to see direct burial cable (UF-B) in the walls when a sheathed wiring is employed. If wire upgrades are possible in the future, or if additional circuits may someday be added, it is a good idea to use flexible chases with single wires pulled through. If, at a later date, you decide to upgrade the system, you can simply pull new wires through the conduit to the desired location. To reduce the effects of electrical magnetic fields (EMFs) use metal cased, twisted wire. The twist in the wire along with the metal conduit reduces the emission of EMFs. Electrical boxes are typically screwed to tapered stakes driven flush with back of recesses cut into the straw. The wires are then let into the boxes. It is important to hold the wires back from the face of the bales so they are not damaged during the construction or post construction process.